Stromboli (Eolian Islands, Italy): Spattering and lava effusion have increased from the NE hornito, feeding a new relatively large sustained lava flow on the Sciara del Fuoco. Activity has decreased a bit yesterday, but strong explosions and small lava overflows from the NE crater rim and a vent at the outer flank continued, accompanied by frequent rockfalls on the Sciara. At the moment, activity seems to be increasing again. Batu Tara (Sunda Islands, Indonesia): New explosions have produced ash plumes rising to 7,000 ft (2.1 km) altitude this morning. Paluweh (off Flores Island, Indonesia): Activity from the lava dome continues. A larger event (explosion and/or dome collapse) produced a fairly large ash plume rising to 10,000 ft (3 km) altitude that drifted 60 nautical miles NW this morning (VAAC Darwin). Gaua (Vanuatu): The Wellington VAAC reported on 29 April that a Qantas Airline pilot noticed a possible ash plume from Gaua volcano. White Island (New Zealand): Geonet has lowered the alert level of the volcano back to green (normal), following a gradual decline in seismic activity over the past weeks. Degassing remains intense, and after heavy rainfall during the recent past, a lake has been re-established at the main crater. Popocatépetl (Central Mexico): Activity at the volcano has picked up in the past 48 hours. Following an earthquake swarm on Saturday with volcanic-tectonic quakes of magnitudes up to 2.3, which was probably the result of a new magma batch rising, an increase in small emissions occurred yesterday with 71 events registered during 24 hours. The largest emission yesterday (at 10:33 local time) produced a steam and ash plume rising 1.2 km above the crater and drifted NE. Fuego (Guatemala): Effusive activity has increased on the expense of weaker explosive activity. The two lava flows on the SW flank towards the Taniluyà and Ash canyon have reached 900 and 700 m length, respectively, and cause frequent avalanches (visible on the seismograph) that reach the vegetation. Telica (Nicaragua): Seismic activity has decreased a bit in energy recently. Although the frequency of earthquakes has slowed down, the quakes, still above background levels, are now of higher magnitude. Tungurahua (Ecuador): Following the initial explosions and ash emissions on Saturday, a significant new eruptive phase has started at the volcano. From 05h30 yesterday morning (local time), an explosion created a steam-ash column rising 4 km initially, then decreased and remained more or less sustained at 2.5 km height above the crater for 30 minutes. 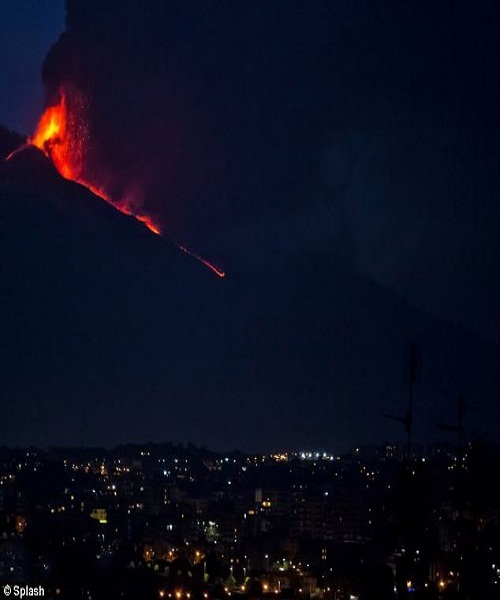 The plume drifted W and SW to more than 100 km and caused light ash falls in areas near and around the volcano, such as Banos, Chacauco, Bilbao, Cusúa, Juive Grande, Pondoa and Pillate.